A beautiful glass fascia that draws the eye, but does it function as well as it looks? A beautiful glass body and a sturdy steel frame with plenty of circulation and ventilation. Installation of components is the biggest downside, with limited cable management space, short header wires and an easy to smudge casing. This case is definitely one to consider for both form and function, just don't expect the initial setup to be a piece of cake. The first thing you notice about this case is that it is stunning. Whether the included lighted fans are turned on or off, the tempered glass makes this case look unlike anything incorporating acrylic. The reflection off of the glass and the way the light catches it from inside and out make this a case that should definitely be shown off. Moving the standard interface items, like power, reset and USB, from the front to the top makes the solid glass front a visual focal point, and puts the controls in a more convenient location. Small, but full-height ventilation is hidden on the sides, behind the glass of the face and the body. Even the covered top ventilation is done in a way that is mostly attractive. One of the things I was most impressed with is that Rosewill did not give up on the mounting side of the case. Normally, translucent cases only give you a view of one side, but the CULLINAN has glass on both left and right. The only place where the design falls down a bit is in the amount of space between the motherboard mounting plate and the glass itself. It is barely wide enough to house the included header cable, meaning that closing the side is a bit difficult. Overall, most of the quality of the case is superb. The glass is thick, the tinting is just the right amount to allow you to see in while still being reflective. The case itself is made of a sturdy steel instead of aluminum, certainly capable of holding the heavier glass in place without issue. The build isn't perfect, though. The removable glass panels on the sides do not sit 100% flush with any of its adjoining sides. The variation is, in our example, very small, but it is enough to be noticeable if you really pay attention. Also, the vent cover on the top of the case is just slightly smaller than the panel that it covers. The piece that actually caused trouble, however, was the rubber grommet protecting the space between the power supply and motherboard. The sides that hold it in place are way too small, making it more likely you will pop it out while running cables. Overall, the functionality of the case, along with its included accessories, is what you would expect. The fans are powerful and quiet, and the fan controller on the front panel gives you some control over the process. Since moving one of our office computers into the CULLINAN, the computer has run more efficiently, as the case cools far better. The top header is also well-placed and easy to access, with good spacing between the USB ports and a separation between USB and audio. The one thing that is a disappointment with the setup is in the lighting of the fans. The top header gives some control over whether or not the lights within the fans are on. Unfortunately, the only way you can turn the lights on is to have the fans at full power. Often, I would like to have the lights on, but have the fans at a lower power, but, alas, that is not an option with this controller. The case is capable of supporting just about anything you might be interested in doing. 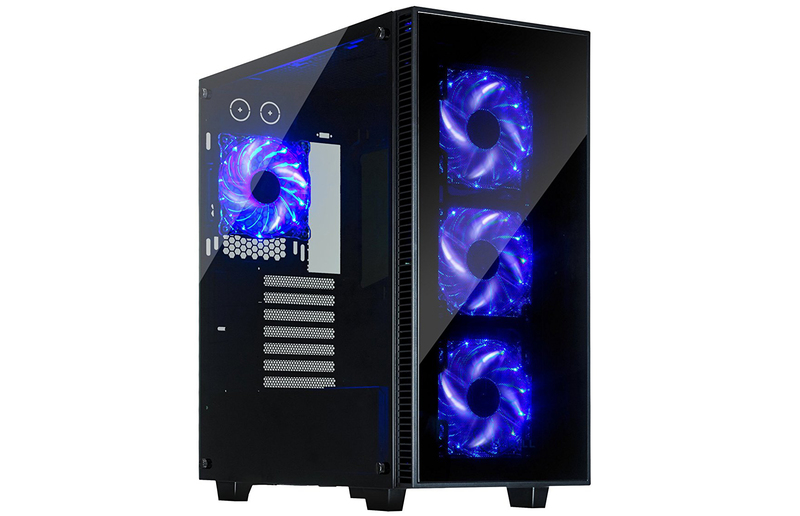 It has three 3.5" and three 2.5" drive bays, has availability for seven expansion slots and can support up to a 200mm power supply. The back panel has grommets for tubing, and there is room enough for a 180mm CPU cooler, making water cooling an easy task. There is also room for three more fans on the top of the case, making a total of seven. The only thing you won't be able to include is an optical drive, as the case has no support for external accessibility, so a fully external drive will be your only choice if you still use optical. While the design of the case makes most tasks within setup and installation fairly easy, there were some that were just this side of tedious. As mentioned in Build Quality, the rubber grommet between the power supply and motherboard is built with sides too small to hold it in place. If even a minimal amount of pressure is applied, such as while pushing the giant motherboard connector through, it is likely to fall off. This happened twice while testing in the office, and getting it to sit back in place once it is out is no picnic, either. If the lip that secures the grommet were just a bit wider, it would eliminate the struggle to get it back in place. Equally frustrating was the right glass panel. The gap between it and the internal housing is just barely too narrow to comfortably hold the cabling for the top panel. This, combined with hard drive power and SATA cables, caused a bit of a struggle when replacing the panel. Just a little more space, even as little as a centimeter, would have made the whole process far easier to accomplish. While talking about the top header cable, the pin structure is a little unfortunate. While not impossible to get everything installed correctly, it would have been nice if the available cable length coming to each pin, especially the power and reset pins, was longer. It was a tight race to get all of the cables connected, with the power pins requiring plyers to get enough leverage. The last issue, which is completely unavoidable but does need to be mentioned, is the glass panels. While replacing the panels, you will need to clean them thoroughly. Fingerprints will end up all over the glass while removing the panels, and will get worse during the process of replacing them. Either wear gloves or use a cloth to prevent as much of it as possible. No matter how hard you try, though, you will need to clean them. We used an electronic screen cleaning gel, which helped reduce further smudges.